Laurence Fishburne | Wanna Catch a Movie? When an unknown, deadly virus is suddenly sprung upon the world with no cure in sight, a global panic breaks out along with an unshakeable feeling of paranoia. With the WHO trying to pinpoint where the virus originated and the Centres for Disease Control and Prevention working on a vaccine to contain the deadly virus, a small time blogger claims to have the cure. Contagion is very loosely focused on Mitch (Matt Damon) and the repercussions his family face after his stepson Clark and wife Beth (Gwyneth Paltrow), die just hours after contracting virus. Aside from this minor pull, Contagion continues to jump from person to person, with no one story being followed, no sense of protagonist being established, no area of attention being sought or feeling of certainty being employed anywhere in the text. Due to this there was very little relation to be made with the characters. There was no personal development or background story behind anyone to emotionally hook an audience, making it hard to connect and feel for the characters and their helpless situations. We end up with this sense of indifference and if someone we’ve been introduced to comes into contact with the virus and becomes contagious, it’s no big deal. This is perhaps the biggest flaw ever in what I feel could have been a fantastically emotionally charged movie. That wasn’t my only peeve with the film. Jude Law was also quite a big peeve. He had a weird Australian accent throughout the film and for me, this was purely distracting. He looked stupid and sounded stupid; I don’t get why he went all Oz on us but it didn’t do anyone any favours. His character was interesting and a good demonstration in showing that even in fatal situations, there’s always something to be gained personally (which will please the fame seekers and money grabbers among us). Lawrence Fishburne and Kate Winslet were my faves. Still unable to shake the image of Morpheus from my mind, with Fishburne as Dr. Ellis Cheever I felt nothing but reassured that things were going to work out. Put that down to good acting or a trait carried with his tough-guy typecast, but Fishburne was one of the only actors I felt commanded the screen. Winslet played Dr. Erin Mears, Cheever’s friend and co-worker, and she was just a joy to watch. Girl is good, no doubt. Though I felt Contagion could have had a lot more going for it, one of its major strengths was that it acted as a great platform in exploring how quickly the world could decline in such a situation as this. How easy society could crumble under the fear of the unknown. It’s also very interesting to see how helpless we’d feel in this situation, especially when we’ve become so accustomed to such an instant problem-solution society thanks to technology and the developing world. It also demonstrates this sense of mass panic brought on by social networks, arguably becoming just as dangerous as the virus itself. Contagion is good but I didn’t like it as much as the hype made out I should. It was a cold, harsh look at how fickle society is and how even in situations where we should surely pull together, there will always be someone wanting to gain from it and get ahead. Why don’t we all just agree to always wash our hands and save ourselves the worry of a deadly epidemic being sprung upon us now? 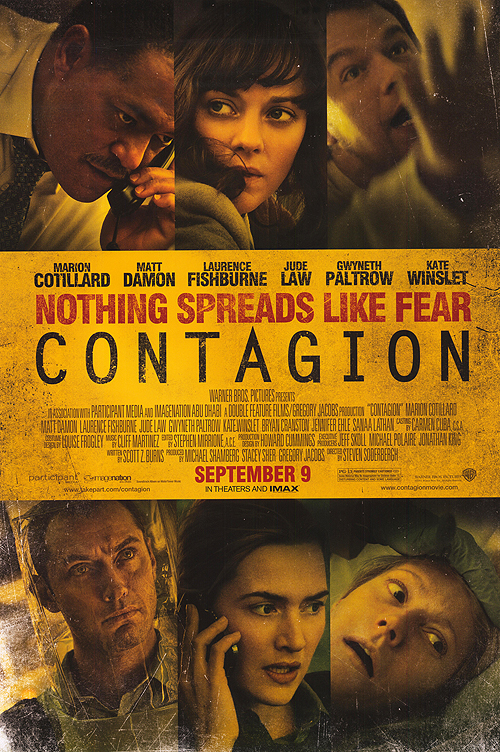 This entry was posted in Film Reviews - C and tagged 2011, 6/10, bird flu, contagion, epidemic, film review, Gwyneth Paltrow, Jude Law, kate winslet, Laurence Fishburne, Marion Cotillard, matt damon, swine flu on November 8, 2011 by Jen Horsman.